I wanted a tangy lemon meringue without too much biscuit. 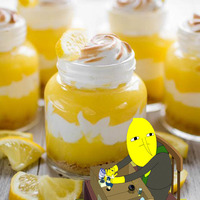 VT Lemon Meringue Tart is a lemon tart with a crispy biscuit pie base. It is pretty nice on it's own but had a bit too much biscuit for the profile I was going for. The lemonade cookie is not a strong flavor but I feel it is useful for acting as bridge between the base and the middle. The middle body is FW lemon meringue pie, topped with more meringue to balance the added biscuit notes. I added FE lemon as it does not fade and provides the tangy kick I was looking for. VT sour lemon gives the sweetness and extra tang to the lemon. You should get full lemon meringue on the inhale and the lighter biscuit at the end of the exhale. Vaped using 0.18ohms at 55 watts single coil rda.